The goal of this assignment is to take three x86/Linux shellcode samples from Metasploit’s Msfpayload tool, use GDB/Ndisasm/Libemu to dissect their functionality and present an analysis. 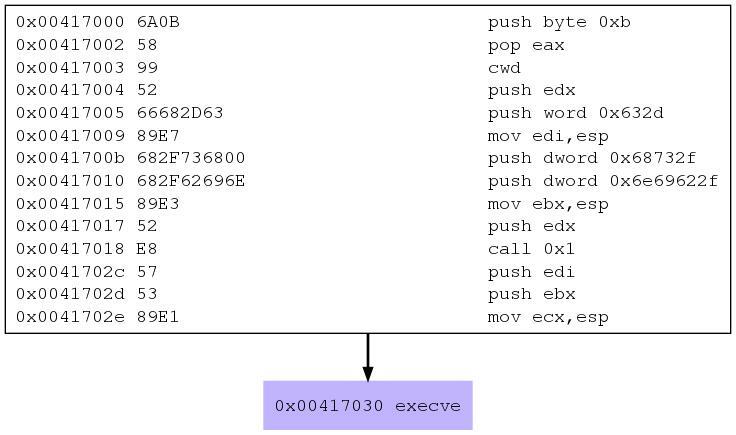 For this blog post I will be specifically analyzing the linux/x86/exec payload. This assignment will build from the previous assignments and so will not be reiterating explanations already covered there. We can see the payload target platform and architecture is Linux x86. The size is 158 bytes. The payload accepts one parameter, CMD, which is required. We can assume that the CMD parameter is used to specify the program to be executed. We can confirm from the description that the payload will exec a user specified program. Msfpayload allows the user to specify different output formats of the payload, such as raw machine code, Dll, Python, etc. We are interested in the raw option which allows us to then feed into a program called sctest from the libemu testsuite. sctest will emulate a computer and actually run the shellcode in a sand boxed environment. So let’s generate the payload using msfpayload and specify ‘/sbin/ifconfig’ as the executable the shellcode should spawn. The output format of msfpayload will be ‘R’, raw, which will be fed into (-S stdin) sctest and an image file name (-G libemu-exec.dot) is specified for a flow diagram of the execution pattern. As we can see from the above sctest output, we have the program instructions and CPU register statuses listed. What is perhaps one of the most powerful outputs though is the de-compiled representation of the program that stands out and clearly indicates the intent of the program. I have highlighted execve() function and we can clearly see the contents of each of the parameters. By the way, the parameters shown are the memory locations of where the actual parameters are stored. This can further be confirmed from the previous assignments where execve() is documented. Let’s confirm how execve works. 1st parameter points to the string /bin/sh representing the file name to run. 3rd parameter is not required and is null. So there we have it, our CMD payload parameter /sbin/ifconfig is actually spawned from the /bin/sh shell using the -c option. -c Read commands from the command_string operand instead of from the standard input. Just for good measure, I’ve included the image flow diagram generated from sctest. libemu-exec.jpg: JPEG image data, JFIF standard 1.01, comment: "CREATOR: gd-jpeg v1.0 (using IJG JPEG v80), default quality"
Not the very best example to use this feature for but hey, it confirms what we observed. We’ll change the msfpayload output to c for easy input into our c shellcode template for testing.